In the early days of yachting in Vancouver, sail predominated almost entirely. Few could afford to operate an expensive steam yacht of the period. The earliest power yachts were teak-built and imported from the Orient. The first private steam yacht in Vancouver was the NAGASAKI, built in Japan and brought to Vancouver before 1890 on the deck of a steamer. She was constructed of teak with copper fastenings. This yacht was followed by the MOW PING – a fine teak-hulled steam launch imported from China. With the development of the gasoline engine, and later the diesel, power cruisers began to appear on Burrard Inlet. 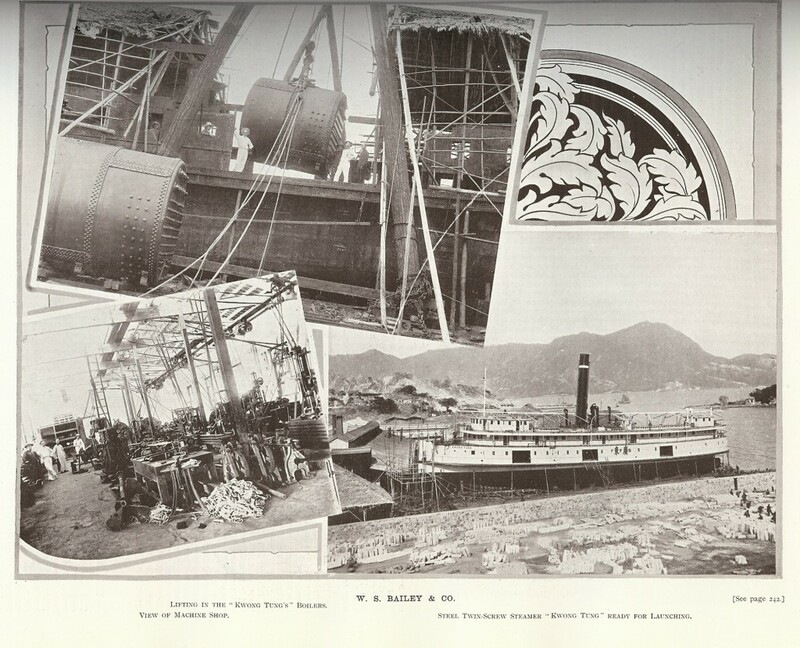 The first gas engines to be sold in Vancouver were imported by Vancouver Yacht Club member, A.W LePage. 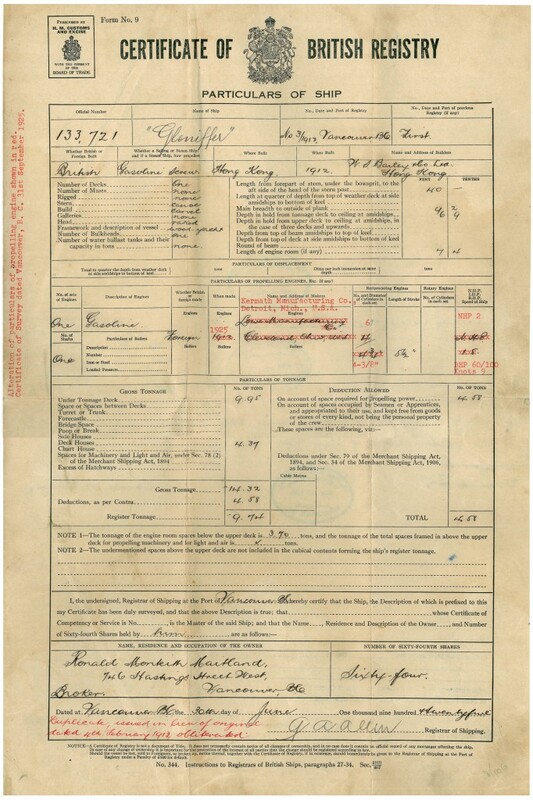 By 1905, the Club fleet list showed nineteen powered vessels on the roster. Just prior to World War One, a thriving business developed importing teak-built yachts from Hong Kong. Many of these were brought out to Vancouver on the decks of freighters. One thriving ship-building company was W.S. Bailey and Co, founded in Hong Kong in 1897 by W.S. Bailey – a consulting engineer and importer of steam engines. In 1900, E.O. Murphy, (the former chief engineer in the C.P.R. liners Empress of India, Empress of China and Empress of Japan), joined Bailey as a partner. For years, their busy shipyard in Kowloon Bay turned out steel steamers and vessels of all kinds. It occupied six acres, with 450 feet of sea frontage. It employed upwards of 2,500 men. W. S. Bailey and Co. Notable amongst the vessels built by W. S. Bailey and Co. is the pleasure yacht, GLENIFFER. She was delivered new to Vancouver in 1912 for owner Stuart Cameron. Her length is 40 feet, beam 9’ 6” and ten tons. She is carvel planked in 1” Burma teak, with a canoe stern. Wide clear ceiling planks are 5/8” teak, ribs are 1- 3/8” by 1 -7/8” teak copper fastened with rivets and bronze drift bolts. Her keel has a large section of scarfed in lead. She has several custom cast bronze fittings, such as her bow apron stem cap with fairleads. Original power was a Lycombing gasoline engine, U.S.A. Later, this was replaced by a six cylinder Kermath, then a Chrysler Crown. Her current engine is a Nissan Chrysler SD 33 diesel. There are two 50-gallon stainless fuel tanks aft and a copper water tank in the bow. Gear shifting at the helm is done with the original brass wheel. She can also be steered from the aft cockpit with her old cast iron removable hand tiller. Throughout her life on the B.C. coast, GLENIFFER was very active in the Royal Vancouver Yacht Club. Later owners included the Commodore, R.M Maitland, followed by J.C. McPherson, then Ken Mair. 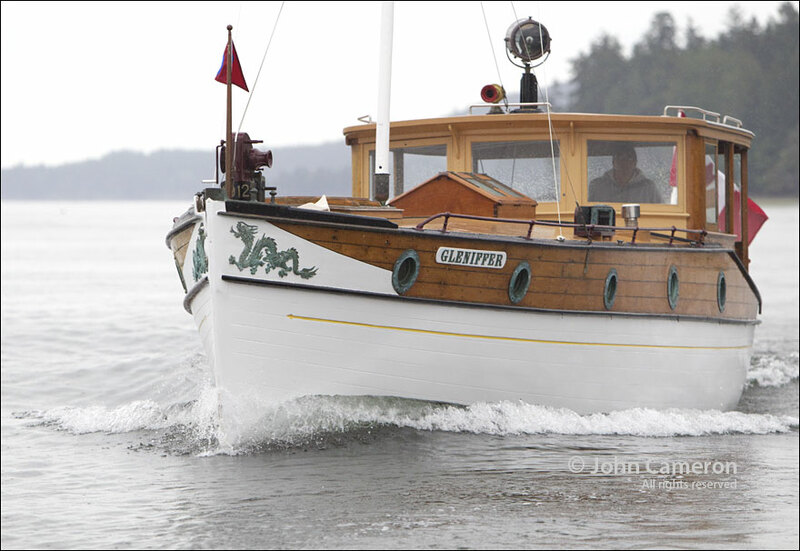 Today, she is kept cruising from her boathouse on Saltspring Island, B.C. by long time owner Thomas Geoffrey Burnett, a coastal towboat Master with the Canadian Merchant Service Guild.